Hello Everyone, a charity worth supporting and I’m raising funds for. 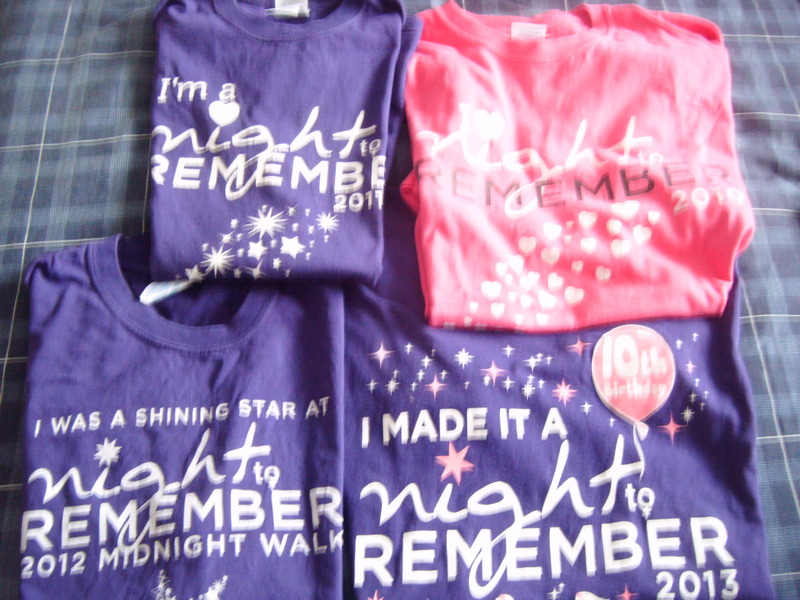 First of all, the above 4 T shirt’s represent the local charity Chestnut Tree House in Sussex, where in May 2010 there was the first Night to Remember Midnight Walk of 10 miles, which I completed in 3 hours. I have now completed 4 and have signed up for number 5 and the Charity has given me number 5 to represent the 5 years of taking part in the walk for the charity. The charity itself is based in Arundel West Sussex and is a hospice for children with life limiting conditions. I feel very humbled to be associated with this charity, there is very little sponsorship so events like the forthcoming Midnight Walk on May 17 is one that I’m looking forward to. If anyone would like to donate to this worthwhile and yet small charity, please go to the Just Giving Page and look for me Amanda Kilmartin. With the Just Giving page, it is in so many different currencies, British Pounds, US Dollars, Euros, so please donate in which ever currency as it all help this lovely charity. This would be such a confidence boost for me, as this year I would like to raise as much money as I can and with your help you can help me achieve this goal. This years Night to Remember takes place on May16/17, its a lovely walk around Sovereign Harbour in Eastbourne, then ou to Holywell and then finishing at the Sovereign Centre in the early hours of Sunday morning. The Charity is hoping that 1000 ladies will take part in the 2015 Midnight Walk, all monies raised will go straight to the Charity and unlike some won’t be swallowed up by admin costs. This entry was posted on 15/03/2014, in Charities, Chestnut Tree House and tagged Charities, Chestnut Tree House, Midnight Walk, Night to Remember.